So far, we have looked at individual techniques as first steps to paraphrasing. At the text-level, we are creating paragraphs and the challenge here is to use more than one technique at the same time to construct an acceptable paraphrase. Text-level paraphrasing is also concerned with ensuring coherence and unity in the paragraph with the use of effective transitions or markers, and other cohesive devices. Read the opening statements of two separate reports of a shooting in France in May. You will see that the information is basically the same, but the reporter of The China Post has employed different grammatical forms and sentence structures to report the same incident. Answer the questions to find out what these techniques are. 1. Hundreds of police blanketed southern France on Tuesday, searching for a gunman - possibly a racist, anti-Semitic serial killer - who killed four people at a Jewish school and may have filmed his attack. Authorities suspect the same killer was behind attacks last week on French paratroopers of North African and French Caribbean origin, that left three dead and one seriously wounded. 2. Thousands of French police were today hunting the Jewish school killer described by the country's president as a "monster on the loose". It emerged that the gunman may have filmed his attack, as he shot dead a teacher, his two young sons and a little girl. The same killer is also suspected of murdering three French soldiers of North African and Caribbean in two separate attacks last week. a) What word-level changes has the writer of The China Post made? b) Can you give at least an example of a clause order change at the sentence level? c) Can you given an example of a sentence type change? d) What terms have not been changed? Why not? e) What other changes do you notice? Text source: Oshima, A. & Hogue, A. (2006). Writing academic English (4th ed.). N.Y.: Pearson Education, Inc. Humans communicate through language, but over the years, many new languages have appeared. As a result, people around the world have found it increasingly difficult to understand one another. The most ideal solution, it would seem, is to establish a global language that everyone could easily use. Kispert (2004) argues that a common global language has clear advantages because it would not only bring about better harmony and understanding but also build more trade relations among diverse cultures and nations. 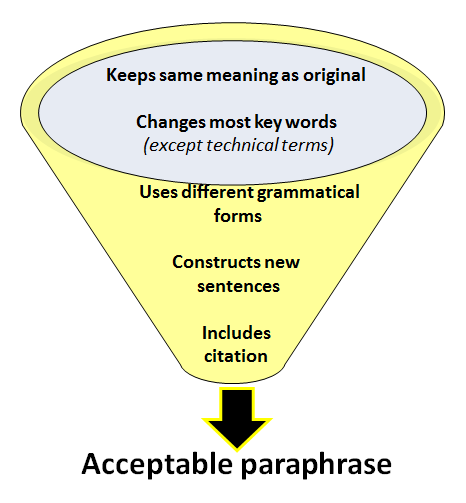 An acceptable paraphrase must satisfy a range of critieria (review this from the figure on the left, shown earlier in the module). Read another paraphrase of the text. Then, from the given options, select those that might explain why it is unacceptable. Why is this paraphrase unacceptable?